Comment: Here’s a good example of something that I write about a lot... Maybe you get tired of reading it, but... much of the magic of magazine cover, and George Gross was really good at it at this point in his career is a strong composition coupled with something of an open-ended narrative... the idea being to encourage the newsstand browser to come to the conclusion that the investment to purchase the magazine is worth it to learn the story. 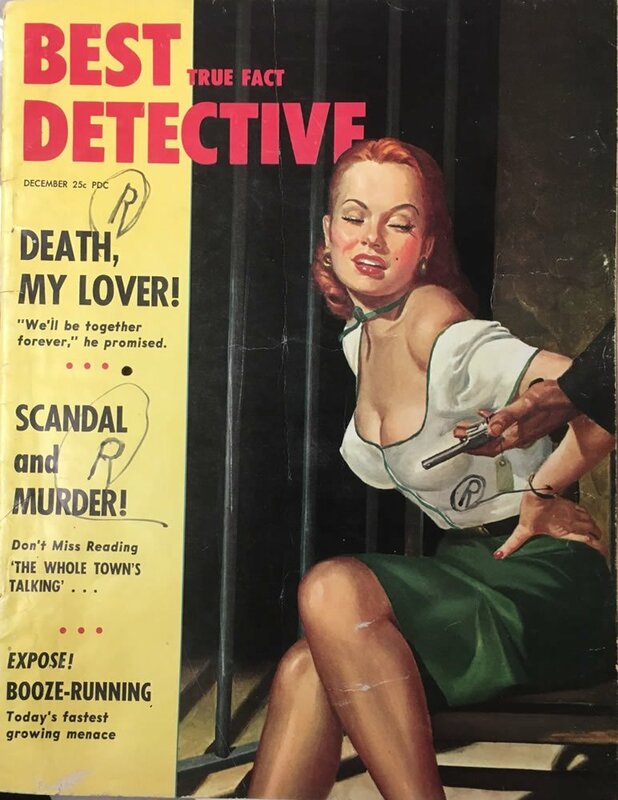 You can now find that out too as a copy of the December 1953 issue of Best True Fact Detective is included with the purchase of the artwork. Condition	 Very good, though canvas is just the slightest bit slack. Impressively framed and ready for your wall. Framed? You bet it is! Publication Information	 Cover illustration, used at least twice... once for True Crime magazine of May, ca. 1952 and once for Best True Fact Detective, December 1953.